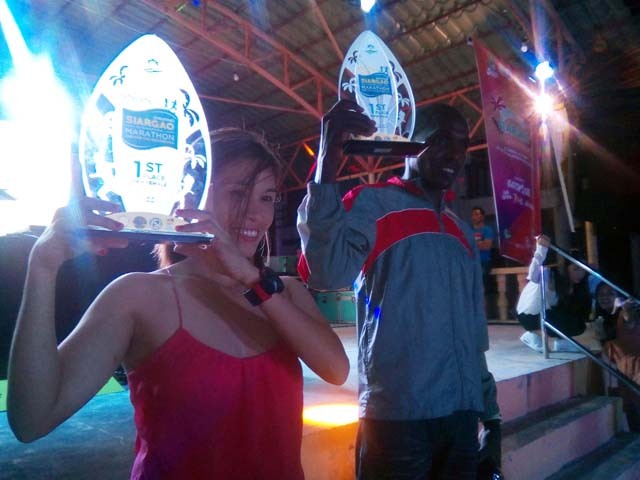 Mururi, Lacson Champions of 1st Siargao International Marathon | JustRunLah! Ryzan Lacson (PHI) and Joseph Mururi topped the 1st Siargao International Marathon last July 23. 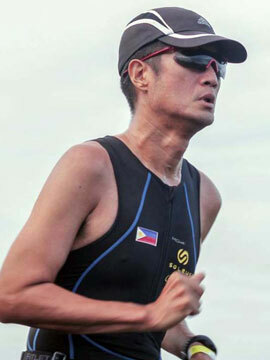 DEL CARMEN, Surigao del Norte – Joseph Mururi of Kenya and Ryzan Lacson of the Philippines were hailed as the champions of the First Siargao International Marathon held last Sunday (July 23). The footrace started and ended at the Del Carmen Elementary School via the Siargao Circumferential Road and passing the adjacent towns of San Benito and Santa Monica on the western coast of the island tourism hotspot. Mururi, who registered just hours before the rainy early morning gun start, breezed throughout the 42.195 kilometers with a winning time of 2:43:43. Second Place went to Cris Aclo (3:22:54) while July Bandojo (3:37:19) took Third Place. Lacson had a relatively easier time in the Women’s Division with her clocking of 4:21:19 almost an hour faster than closest pursuer Pam Apuhin (5:19:16). Third Place went to Sheila Mae Montero (5:31:27). Aside from the full marathon, a half-marathon was also staged. Elmer Bartolo (1:15:38), Johnrey Tumanda (1:24:56) and Aldrin Batac (1:25:08) and Michelle Aclo (1:47:31), Madelyn Carter (1:55:30) and Andrea Calleja (1:59:17) landed podium finishes in the Men’s and Women’s Divisions respectively. There was also a five-kilometer fun run exclusive for the youth and residents of Siargao. All the 42 and 21-kilometer winners received their trophies, cash prizes and gifts from sponsors at the post-race party held that same evening at the Boulevard in General Luna town. 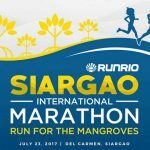 The First Siargao International Marathon was staged in order to raise awareness and educate the public about propagating and preserving our mangrove forests. According to Mayor Alfredo Matugas Coro II, his town of Del Carmen is where one can find one of the largest mangrove forest in the Philippines. The young mayor also expressed elation that the marathon was successfully completed and that another international sporting event has come to Siargao after Surfing and Game Fishing. The SIM 2017 was organized by RunRio Events of Coach Rio de la Cruz with the help of the Municipal Government of Del Carmen, Gov. Soledad F. Matugas of Surigao del Norte, Rep. Francisco Jose “Bingo” Matugas II of the First District of Surigao del Norte, Department of Tourism, Skyjet Airlines, H & M Sport, Pascual Greek Yogurt, The Live Fit Lab, Tetra Pak and Gatorade. The fun does not end with the last runner crossing the finish line. A mangrove planting activity and talk will be held on July 25 (Tuesday) in Del Carmen with one seedling pledged in the name of every runner who signed up.